This most gentle and welcoming of all interactive dolphins seems to have stirred up the most political controversy amongst the human beings along her shores. Local reaction to the presence of the dolphin at Doolin was mixed. Access to the cliffs was from a dirt track through privately-owned land and then from a public footpath. Cars parked by sightseers on and near the track eroded the verges and sometimes blocked access to farmers’ gateways. People descending from the coastal path climbed over a fence to do so and the landowner was worried it was being damaged. Others left litter. Needless to say, the fact that it was not dolphin-swimmers doing any of this damage, but day-trippers from nearby seaside resorts did not make any difference - the dolphin and her fans still got the blame! Some local people loved to walk out to the cliffs to watch the dolphin, but many others were concerned that too many visitors would come for the infrastructure to cope with. They didn’t want to see the kind of commercialisation which had spoilt Dingle. Even local shopkeepers and businesses, far from wanting to exploit the situation, seemed to want it to go away. Some biologists and conservationists were concerned about the safety of the too-trusting dolphin, whilst others were mindful of the dangerous seas which had already taken many lives in the area and which might surprise visitors focused only on getting close to a wild dolphin. Clare County Council, concerned about their liability if someone should be injured while descending the cliffs or swimming, put up a notice warning people not to swim at all, and for a while a lifeguard from Lahinch was posted at the Jump. Local people who had been swimming there for years did not take kindly to these measures, and they were ignored. A sign posted by Duchas was equally ridiculed as it told people not to approach the dolphin, when hundreds of people had already seen that it was the dolphin approaching people and not the other way around. Duchas went on to announce on local radio and then in the national press that people should on no account go swimming with the dolphin, thus drawing huge crowds who had not previously known about the dolphin being there at all. Throughout the dolphin’s stay in Doolin, official pronouncements were confused as to whether they were concerned about public safety or the dolphin’s well-being, and by muddling the two issues the authorities unfortunately reduced the impact of their own arguments. All the fears about the impact of the dolphin's presence were expressed with varying degrees of incoherence at a public meeting in Doolin convened by the Irish Whale and Dolphin Group (IWDG) in September 2000. An announcement was also made at that meeting that a local businessman had already commissioned a passenger boat with the specific purpose of running dolphin trips from Doolin pier, as in Dingle. Naturally this did not please either those who wanted to swim with or watch the dolphin in peace, not those who wanted to avoid their village becoming further commercialised. We argued that the problems of access, swimmers and boats should be treated separately. If existing regulations which forbade the fast approach to and harassment of dolphins by motorboats were enforced, then the least of the problems would be the dolphin’s safety, as she could easily avoid swimmers if she wanted to. Meanwhile we should respect her right to choose that kind of interaction if she wanted to, and also respect the right of people to do potentially dangerous things like swimming in the ocean and scrambling down cliffs, whilst at the same time advising the public in a non-hysterical way of the potential dangers. The meeting broke up without any resolution, and the problems for Doolin were soon solved when the winter storms arrived a month early, making swimming impossible and driving both visitors and dolphin away to more sheltered spots. 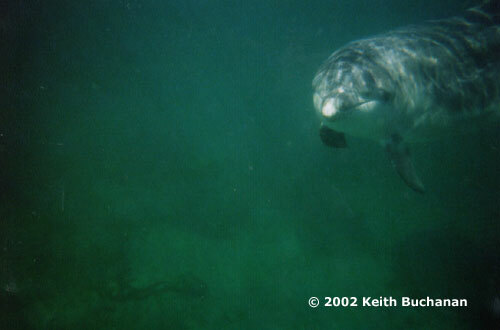 In June 2001, Dusty’s new residence at Derreen near Fanore became widely publicised in the media and people started flocking to swim with her again. The new site is much easier to get to than the ‘Jump’ at Doolin. A gateway gives access to a narrow strip of farmland between the public road and the rocky shore. The landowner has at times been willing to allow or even encourage access and at others has not. A public meeting in July addressed similar issues to the Doolin meeting the previous year, but again no resolution was achieved. At the end of August 2001 the landowner started charging for access to the slip via his land, although this was not always enforced. The idea of a 'toll' may have been provoked by the Paddywagon tours, who had been running 50-seater coaches out from Doolin twice a day, charging tourists £5 a head to come and see the dolphin, something which got a lot of people's backs up locally, especially as there is no parking for coaches and they tended to block the roads. The landowner began to feel, not surprisingly, that other people were making money out of the situation, whereas he was left with the inconvenience and expense of mending his walls and paying public liability insurance for trippers to swarm over his land. There has also been conflict between the landowner and Clare County Council, who were claiming a right of way to the slip and who in 2001 erected another totally ignored sign, warning people not to swim there. They appear to have abandoned their claim and their signs now and to have left the field to the landowner, as it were. The Council also objected, incidentally, when the landowner installed a new gateway to provide pedestrian access without having to open the farm gate (which might have encouraged people to drive cars in). Over the winter he has now repaired the wall along his frontage and he intends the only access to be through the existing gate, where an entrance fee will be charged once the season gets going. However, if the dolphin continues to attract bigger crowds in 2002, as she is likely to, then there are sure to be further problems over access and car parking. The issue as we see it is to resolve the possibly conflicting interests of a number of parties. 1. Dolphin swimmers and lovers of nature in general want unrestricted access to the seashore, wherever the dolphin might choose to hang out. 2. The landowner wants to be compensated for the damage and wear and tear caused to his property. 3. The Irish Whale and Dolphin Group, with other conservation interests, want the dolphin's safety and wellbeing to be the prime concern. 4. Clare County Council just appear to want the dolphin (and all the problems she is supposedly responsible for creating!) to go somewhere else. 5. The Garda Siochana want to ensure the free movement of traffic along the road. 6. The Coastguard Service want to avoid any loss of life or injury to people swimming in the sea. 7. Duchas, who as administrators of the Wildlife Service are technically the statutory body responsible, do not yet appear to have formulated a position. We believe that these conflicts can be resolved with the implementation of a simple management plan agreed between all parties. We believe that swimmers and anybody else should be allowed access to the shore, which is state property. In return we accept that the landowner is entitled to charge a modest fee for access via his land. By providing safe access, the landowner would be doing the community a favour, and in return the Council could grant him immediate permission to open a small gateway and indeed to put up public toilets and other temporary facilities if he so wishes. If he or another local landowner was willing to open a field for car parking, again subject to a modest charge, then the council could benefit everyone by smoothing their path. This would also solve many of the worries of the gardai. We do not believe the location is suitable for coach access or the numbers of casual visitors that these threaten to bring, however, and we think that coach operators should be discouraged from halting anywhere nearby. The safety of both swimmers and the dolphin could be protected, insofar as is humanly possible, by the appointment of Dolphin Wardens. These would ideally be trained lifeguards, who would not only be there in case of an emergency and to advise on dangerous sea conditions and best points of access, but also to educate people about suitable behaviour around the dolphin. We have drawn up a new code of conduct in collaboration with the IWDG to cope with this situation. The IWDG are prepared to train such Wardens and we are talking about ways of funding such a scheme. We believe that the best approach will be by agreement between all the above parties and advisory education of the public rather than regulations and coercion, and this is what we are working to achieve at present.